The War on Terror (also known as the Global War on Terror or the War on Terrorism) is an international military campaign led by the United States and the United Kingdom with the support of other North Atlantic Treaty Organisation (NATO) as well as non-NATO countries. Originally, the campaign was waged against al-Qaeda and other militant organizations with the purpose of eliminating them. The phrase War on Terror was first used by US President George W. Bush and other high-ranking US officials to denote a global military, political, legal and ideological struggle against organizations designated as terrorist and regimes that were accused of having a connection to them or providing them with support or were perceived, or presented as posing a threat to the US and its allies in general. It was typically used with a particular focus on militant Islamists and al-Qaeda. Although the term is not officially used by the administration of US President Barack Obama (which instead uses the term Overseas Contingency Operation), it is still commonly used by politicians, in the media and officially by some aspects of government, such as the US Army’s Global War on Terrorism Service Medal. The notion of a “war on terror” has been criticized for lacking a defined and identifiable enemy, thus making it a potential framework for perpetual military action pursuing other goals. In May 1996 the group World Islamic Front for Jihad Against Jews and Crusaders (WIFJAJC), sponsored by Osama bin Laden and later reformed as al-Qaeda, started forming a large base of operations in Afghanistan, where the Islamist extremist regime of the Taliban had seized power that same year. Following the bombings of US embassies in Kenya and Tanzania, US President Bill Clinton launched Operation Infinite Reach, a bombing campaign in Sudan and Afghanistan against targets the US asserted were associated with WIFJAJC, although others have questioned whether a pharmaceutical plant in Sudan was used as a chemical warfare plant. The plant produced much of the region’s antimalarial drugs and around 50% of Sudan’s pharmaceutical needs. The strikes failed to kill any leaders of WIFJAJC or the Taliban. In 1984 the Reagan Administration used the term “war against terrorism” as part of an effort to pass legislation that was designed to freeze assets of terrorist groups and marshal the forces of government against them. Author Shane Harris asserts this was a reaction to the 1983 Beirut barracks bombing. US President Barack Obama has rarely used the term, but in his inaugural address on January 20, 2009, he stated “Our nation is at war, against a far-reaching network of violence and hatred.” In March 2009 the Defense Department officially changed the name of operations from “Global War on Terror” to “Overseas Contingency Operation” (OCO). In March 2009, the Obama administration requested that Pentagon staff members avoid use of the term, instead using “Overseas Contingency Operation”. Operation Active Endeavour is a naval operation of NATO started in October 2001 in response to the September 11 attacks. It operates in the Mediterranean Sea and is designed to prevent the movement of militants or weapons of mass destruction and to enhance the security of shipping in general. The operation has also assisted Greece with its prevention of illegal immigration. On September 20, 2001, in the wake of the September 11 attacks, George W. Bush delivered an ultimatum to the Taliban government of Afghanistan to turn over Osama bin Laden and al-Qaeda leaders operating in the country or face attack. The Taliban demanded evidence of bin Laden’s link to the September 11 attacks and, if such evidence warranted a trial, they offered to handle such a trial in an Islamic Court. The US refused to provide any evidence. Subsequently, in October 2001, US forces (with UK and coalition allies) invaded Afghanistan to oust the Taliban regime. On October 7, 2001, the official invasion began with British and US forces conducting airstrike campaigns over enemy targets. Kabul, the capital city of Afghanistan, fell by mid-November. The remaining al-Qaeda and Taliban remnants fell back to the rugged mountains of eastern Afghanistan, mainly Tora Bora. In December, Coalition forces (the US and its allies) fought within that region. It is believed that Osama bin-Laden escaped into Pakistan during the battle. In March 2002, the United States and other NATO and non-NATO forces launched Operation Anaconda in the hopes that they’ll destroy any remaining al-Qaeda and Taliban forces in the Shah-i-Kot Valley and Arma Mountains of Afghanistan. The Taliban suffered heavy casualties and evacuated the region. The Taliban regrouped in western Pakistan and began to unleash an insurgent-style offensive against Coalition forces in late 2002. Throughout southern and eastern Afghanistan, firefights broke out between the surging Taliban and Coalition forces. Coalition forces responded with a series of military offensives and an increase in the amount of troops in Afghanistan. In February 2010, Coalition forces launched Operation Moshtarak in southern Afghanistan along with other military offensives in the hopes that they would destroy the Taliban insurgency once and for all. Peace talks are also underway between Taliban affiliated fighters and Coalition forces. In January 2002, the United States Special Operations Command, Pacific deployed to the Philippines to advise and assist the Armed Forces of the Philippines in combating Filipino Islamist groups. The operations were mainly focused on removing the Abu Sayyaf Group (ASG) and Jemaah Islamiyah (JI) from their stronghold on the island of Basilan. The second portion of the operation was conducted as a humanitarian program called “Operation Smiles.” The goal of the program was to provide medical care and services to the region of Basilan as part of a “Hearts and Minds” program. US soldiers and French Naval commandos in Djibouti. In October 2002, the Combined Joint Task Force – Horn of Africa (CJTF-HOA) was established in Djibouti at Camp Lemonnier. It contains approximately 2,000 personnel including US military and special operations forces (SOF) and coalition force members, Combined Task Force 150 (CTF-150). Task Force 150 consists of ships from a shifting group of nations, including Australia, Canada, France, Germany, Italy, Netherlands, Pakistan, New Zealand and the United Kingdom. The primary goal of the coalition forces is to monitor, inspect, board and stop suspected shipments from entering the Horn of Africa region and affecting the US’ Operation Iraqi Freedom. On July 1, 2006, a Web-posted message purportedly written by Osama bin Laden urged Somalis to build an Islamic state in the country and warned western governments that the al-Qaeda network would fight against them if they intervened there. On December 14, 2006, the US Assistant Secretary of State Jendayi Frazer claimed al-Qaeda cell operatives were controlling the Islamic Courts Union, a claim denied by the ICU. By late 2006, the UN-backed Transitional Federal Government (TFG) of Somalia had seen its power effectively limited to Baidoa, while the Islamic Courts Union controlled the majority of southern Somalia, including the capital of Mogadishu. On December 20, 2006, the Islamic Courts Union launched an offensive on the government stronghold of Baidoa, and saw early gains before Ethiopia intervened in favor of the government. By December 26, the Islamic Courts Union retreated towards Mogadishu, before again retreating as TFG/Ethiopian troops neared, leaving them to take Mogadishu with no resistance. The ICU then fled to Kismayo, where they fought Ethiopian/TFG forces in the Battle of Jilib. On January 8, 2007, the US launched the Battle of Ras Kamboni by bombing Ras Kamboni using AC-130 gunships. On September 14, 2009, US Special Forces killed two men and wounded and captured two others near the Somali village of Baarawe. Witnesses claim that helicopters used for the operation launched from French-flagged warships, but that could not be confirmed. A Somali based al-Qaida affiliated group, the Al-Shabaab, has confirmed the death of “sheik commander” Saleh Ali Saleh Nabhan along with an unspecified number of militants. Nabhan, a Kenyan, was wanted in connection with the 2002 Mombasa attacks. Operation Enduring Freedom – Trans Sahara (OEF-TS) is the name of the military operation conducted by the United States and partner nations in the Sahara/Sahel region of Africa, consisting of counter-terrorism efforts and policing of arms and drug trafficking across central Africa. A British C-130J Hercules aircraft launches flare countermeasures prior to being the first coalition aircraft to land on the newly reopened military runway at Baghdad International Airport. Iraq had been listed as a State sponsor of international terrorism by the United States since 1990, when Saddam Hussein fell out of US favor. The regime of Saddam Hussein proved a continuing problem for the UN and Iraq’s neighbors in its use of chemical weapons against Iranians and Kurds. After the Gulf War, the US, French and British militaries instituted and began patrolling Iraqi no-fly zones, to protect Iraq’s Kurdish minority and Shi’a Arab population—both of which suffered attacks from the Hussein regime before and after the Gulf War—in Iraq’s northern and southern regions, respectively. US forces continued in combat zone deployments through November 1995 and launched Operation Desert Fox against Iraq in 1998 after it failed to meet US demands of “unconditional cooperation” in weapons inspections. Prior to Operation Desert Fox, US president Bill Clinton predicted “And mark my words, he will develop weapons of mass destruction. He will deploy them, and he will use them.” Clinton also declared a desire to remove Hussein from power and in the same speech said, “The hard fact is that so long as Saddam remains in power, he threatens the well-being of his people, the peace of his region, the security of the world.” In the aftermath of Operation Desert Fox, during December 1998, Iraq announced that it would no longer respect the no-fly zones and resumed its attempts to shoot down US aircraft. Air strikes by the British and US against Iraqi anti-aircraft and military targets continued over the next few years. Also in 1998, Clinton signed the Iraq Liberation Act, which called for regime change in Iraq on the basis of its alleged possession of weapons of mass destruction, oppression of Iraqi citizens, and attacks on other Middle Eastern countries. Resolution 1441 did not authorize the use of force by member states. The Iraqi government subsequently allowed UN inspectors some access to Iraqi sites, while the US government continued to assert that Iraq was being obstructionist. In October 2002, a large bipartisan majority in the United States Congress authorized the president to use force if necessary to disarm Iraq in order to “prosecute the war on terrorism.” After failing to overcome opposition from France, Russia, and China against a UNSC resolution that would sanction the use of force against Iraq, and before the UN weapons inspectors had completed their inspections (which were claimed to be fruitless by the US because of Iraq’s alleged deception), the United States assembled a “Coalition of the Willing” composed of nations who pledged support for its policy of regime change in Iraq. American soldiers take cover during a firefight with guerrilla forces in the Al Doura section of Baghdad. Map of the invasion routes and major operations/battles of the Iraq War as of 2007. The Iraq War began in March 2003 with an air campaign, which was immediately followed by a U.S.-led ground invasion. The Bush administration stated the invasion was the “serious consequences” spoken of in the UNSC Resolution 1441. Baghdad, Iraq’s capital city, fell in April 2003 and Saddam Hussein’s government quickly dissolved. On May 1, 2003, Bush announced that major combat operations in Iraq had ended. However, an insurgency arose against the U.S.-led coalition and the newly developing Iraqi military and post-Saddam government. The insurgency, which included al-Qaeda affiliated groups, led to far more coalition casualties than the invasion. Other elements of the insurgency were led by fugitive members of President Hussein’s Ba’ath regime, which included Iraqi nationalists and pan-Arabists. Many insurgency leaders are Islamists and claim to be fighting a religious war to reestablish the Islamic Caliphate of centuries past. Iraq’s former president, Saddam Hussein was captured by U.S. forces in December 2003. He was executed in 2006. In 2004, the insurgent forces grew stronger. The United States conducted attacks on insurgent strongholds in cities like Najaf and Fallujah. In January 2007, President Bush presented a new strategy for Operation Iraqi Freedom based upon counter-insurgency theories and tactics developed by General David Petraeus. The Iraq War troop surge of 2007 was part of this “new way forward” and, along with US backing of Sunni groups it had previously sought to defeat, has been credited with a widely recognized dramatic decrease in violence by up to 80%. The war entered a new phase on September 1, 2010, with the official end of US combat operations. However, 50,000 US troops remain in an advise and assist role to provide support for Iraqi security forces. The United Kingdom is the second largest contributor of troops in Afghanistan. On September 12, 2001, less than 24 hours after the September 11 attacks in New York City and Washington, D.C., NATO invoked Article 5 of the North Atlantic Treaty and declared the attacks to be an attack against all 19 NATO member countries. Australian Prime Minister John Howard also declared that Australia would invoke the ANZUS Treaty along similar lines. In the following months, NATO took a wide range of measures to respond to the threat of terrorism. On November 22, 2002, the member states of the Euro-Atlantic Partnership Council (EAPC) decided on a Partnership Action Plan against Terrorism which explicitly states that “EAPC States are committed to the protection and promotion of fundamental freedoms and human rights, as well as the rule of law, in combating terrorism.” NATO started naval operations in the Mediterranean Sea designed to prevent the movement of terrorists or weapons of mass destruction as well as to enhance the security of shipping in general called Operation Active Endeavour. Support for the United States cooled when America made clear its determination to invade Iraq in late 2002. Even so, many of the “coalition of the willing” countries that unconditionally supported the US-led military action have sent troops to Afghanistan, particular neighboring Pakistan, which has disowned its earlier support for the Taliban and contributed tens of thousands of soldiers to the conflict. Pakistan was also engaged in the War in North-West Pakistan (Waziristan War). Supported by US intelligence, Pakistan was attempting to remove the Taliban insurgency and al-Qaeda element from the northern tribal areas. Map of countries currently contributing troops to ISAF as of 5 March 2010. Major contributors (over 1000 troops) in dark green, other contributors in light green, and former contributors in magenta. December 2001 saw the creation of the NATO-led International Security Assistance Force (ISAF) to assist the Afghan Transitional Administration and the first post-Taliban elected government. With a renewed Taliban insurgency, it was announced in 2006 that ISAF would replace the US troops in the province as part of Operation Enduring Freedom. Following the September 11, 2001 attacks, former President of Pakistan Pervez Musharraf sided with the United States against the Taliban government in Afghanistan after an ultimatum by US President George W. Bush. Musharraf agreed to give the United States the use of three airbases for Operation Enduring Freedom. United States Secretary of State Colin Powell and other administration officials met with Musharraf. On September 19, 2001, Musharraf addressed the people of Pakistan and stated that, while he opposed military tactics against the Taliban, Pakistan risked being endangered by an alliance of India and the US if it did not cooperate. In 2006, Musharraf testified that this stance was pressured by threats from the US, and revealed in his memoirs that he had “war-gamed” the United States as an adversary and decided that it would end in a loss for Pakistan. On January 12, 2002, Musharraf gave a speech against Islamic extremism. He unequivocally condemned all acts of terrorism and pledged to combat Islamic extremism and lawlessness within Pakistan itself. He stated that his government was committed to rooting out extremism and made it clear that the banned militant organizations would not be allowed to resurface under any new name. He said, “the recent decision to ban extremist groups promoting militancy was taken in the national interest after thorough consultations. It was not taken under any foreign influence”. In 2002, the Musharraf-led government took a firm stand against the jihadi organizations and groups promoting extremism, and arrested Maulana Masood Azhar, head of the Jaish-e-Mohammed, and Hafiz Muhammad Saeed, chief of the Lashkar-e-Taiba, and took dozens of activists into custody. An official ban was imposed on the groups on January 12. Later that year, the Saudi born Zayn al-Abidn Muhammed Hasayn Abu Zubaydah was arrested by Pakistani officials during a series of joint US-Pakistan raids. Zubaydah is said to have been a high-ranking al-Qaeda official with the title of operations chief and in charge of running al-Qaeda training camps. Other prominent al-Qaeda members were arrested in the following two years, namely Ramzi bin al-Shibh, who is known to have been a financial backer of al-Qaeda operations, and Khalid Sheikh Mohammed, who at the time of his capture was the third highest ranking official in al-Qaeda and had been directly in charge of the planning for the September 11 attacks. In 2004, the Pakistan Army launched a campaign in the Federally Administered Tribal Areas of Pakistan’s Waziristan region, sending in 80,000 troops. The goal of the conflict was to remove the al-Qaeda and Taliban forces in the region. After the fall of the Taliban regime many members of the Taliban resistance fled to the Northern border region of Afghanistan and Pakistan where the Pakistani army had previously little control. With the logistics and air support of the United States, the Pakistani Army captured or killed numerous al-Qaeda operatives such as Khalid Sheikh Mohammed, wanted for his involvement in the USS Cole bombing, the Bojinka plot, and the killing of Wall Street Journal reporter Daniel Pearl. The United States has carried out a campaign of Drone attacks on targets all over the Federally Administered Tribal Areas. However, the Pakistani Taliban resistance still operates there. To this day it’s estimated that 15 US soldiers were killed while fighting al-Qaeda and Taliban remnants in Pakistan since the War on Terror began. Since 9/11, al-Qaeda and other radical Islamic groups have successfully executed major attacks in several parts of the world. In addition, there have been several planned terrorist attacks that were not successful. In the three years before the attacks of September 11, Pakistan received approximately $9 million in American military aid. In the three years after, the number increased to $4.2 billion, making it the country with the maximum funding post 9/11. Such a huge inflow of funds has raised concerns in the Indian press that these funds were given without any accountability, as the end uses not being documented, and that large portions were used to suppress civilians’ human rights and to purchase weapons to contain domestic problems like the Balochistan unrest. Pakistan has stated that India has been supporting terror groups within the Federally Administered Tribal Areas and Balochistan with the aim of creating unrest within the country. On May 20, 2007, a conflict began in north Lebanon after fighting broke out between Fatah al-Islam, an Islamist militant organization, and the Lebanese Armed Forces in Nahr al-Bared, a Palestinian refugee camp near Tripoli. The conflict evolved mostly around the Siege of Nahr el-Bared, but minor clashes also occurred in the Ain al-Hilweh refugee camp in southern Lebanon and several bombings took place in and around Lebanon’s capital, Beirut. Fatah-al-Islam has been described as a militant mujahid movement that draws inspiration from al-Qaeda. The US provided military aid to the Lebanese government during the conflict. On September 7, 2007, Lebanese government forces captured the camp and declared victory. The United States has also conducted a series of military strikes on al-Qaeda militants in Yemen since the War on Terror began. Yemen has a weak central government and a powerful tribal system that leaves large lawless areas open for militant training and operations. Al-Qaida has a strong presence in the country. The US, in an effort to support Yemeni counter-terrorism efforts, has increased their military aid package to Yemen from less than $11 million in 2006 to more than $70 million in 2009, as well as providing up to $121 million for development over the next three years. A US Immigration and Customs Enforcement helicopter patrols the airspace over New York City. In addition to military efforts abroad, in the aftermath of 9/11 the Bush Administration increased domestic efforts to prevent future attacks. Various government bureaucracies which handled security and military functions were reorganized. A new cabinet level agency called the United States Department of Homeland Security was created in November 2002 to lead and coordinate the largest reorganization of the US federal government since the consolidation of the armed forces into the Department of Defense. The Justice Department launched a Special Registration procedure for certain male non-citizens in the US, requiring them to register in person at offices of the Immigration and Naturalization Service. The USA PATRIOT Act of October 2001 dramatically reduces restrictions on law enforcement agencies’ ability to search telephone, e-mail communications, medical, financial, and other records; eases restrictions on foreign intelligence gathering within the United States; expands the Secretary of the Treasury’s authority to regulate financial transactions, particularly those involving foreign individuals and entities; and broadens the discretion of law enforcement and immigration authorities in detaining and deporting immigrants suspected of terrorism-related acts. The act also expanded the definition of terrorism to include domestic terrorism, thus enlarging the number of activities to which the USA PATRIOT Act’s expanded law enforcement powers could be applied. A new Terrorist Finance Tracking Program monitored the movements of terrorists’ financial resources (discontinued after being revealed by The New York Times newspaper). Telecommunication usage by known and suspected terrorists was studied through the NSA electronic surveillance program. The Patriot Act is still in effect. Political interest groups have stated that these laws remove important restrictions on governmental authority, and are a dangerous encroachment on civil liberties, possible unconstitutional violations of the Fourth Amendment. On July 30, 2003, the American Civil Liberties Union (ACLU) filed the first legal challenge against Section 215 of the Patriot Act, claiming that it allows the FBI to violate a citizen’s First Amendment rights, Fourth Amendment rights, and right to due process, by granting the government the right to search a person’s business, bookstore, and library records in a terrorist investigation, without disclosing to the individual that records were being searched. Also, governing bodies in a number of communities have passed symbolic resolutions against the act. In a speech on June 9, 2005, Bush said that the USA PATRIOT Act had been used to bring charges against more than 400 suspects, more than half of whom had been convicted. Meanwhile the ACLU quoted Justice Department figures showing that 7,000 people have complained of abuse of the Act. 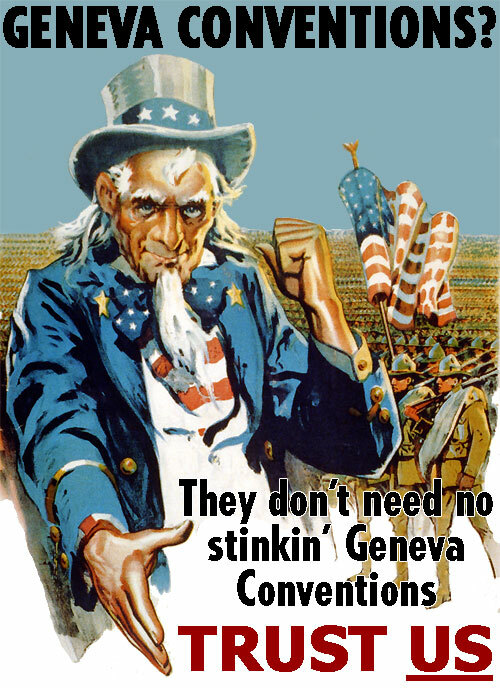 By 2003, 12 major conventions and protocols were designed to combat terrorism. These were adopted and ratified by a number of states. These conventions require states to co-operate on principal issues regarding unlawful seizure of aircraft, the physical protection of nuclear materials, and the freezing of assets of militant networks. In 2005 the UN Security Council adopted Resolution 1624 concerning incitement to commit acts of terrorism and the obligations of countries to comply with international human rights laws. Although both resolutions require mandatory annual reports on counter-terrorism activities by adopting nations, the United States and Israel have both declined to submit reports. In the same year, the United States Department of Defense and the Chairman of the Joint Chiefs of Staff issued a planning document, by the name “National Military Strategic Plan for the War on Terrorism” which stated that it constituted the “comprehensive military plan to prosecute the Global War on Terror for the Armed Forces of the United States…including the findings and recommendations of the 9/11 Commission and a rigorous examination with the Department of Defense”. On January 9, 2007, the House of Representatives passed a bill, by a vote of 299-128, enacting many of the recommendations of the 9/11 Commission The bill passed in the US Senate, by a vote of 60-38, on March 13, 2007 and it was signed into law on August 3, 2007 by President Bush. It became Public Law 110-53. The Office of Strategic Influence was secretly created after 9/11 for the purpose of coordinating propaganda efforts, but was closed soon after being discovered. The Bush administration implemented the Continuity of Operations Plan (or Continuity of Government) to ensure that US government would be able to continue in catastrophic circumstances. Since 9/11, extremists made various attempts to attack the US homeland, with varying levels of organization and skill. For example, vigilant passengers aboard a transatlantic flight prevented Richard Reid, in 2001, and Umar Farouk Abdulmutallab, in 2009, from detonating an explosive device. The Obama administration has promised the closing of the Guantanamo Bay detention camp, increased the number of troops in Afghanistan, and promised the withdrawal of its troops from Iraq. Participants in a rally, dressed as hooded detainees. The notion of a “war” against “terror” or “terrorism” has proven highly contentious, with critics charging that it has been exploited by participating governments to pursue long-standing policy objectives, reduce civil liberties, and infringe upon human rights. Some argue that the term war is not appropriate in this context, since they believe there is no identifiable enemy, and that it is unlikely international terrorism can be brought to an end by military means. The Director of Public Prosecutions and head of the Crown Prosecution Service in the United Kingdom, Ken McDonald has stated that those responsible for acts of terror such as the 7 July 2005 London bombings are not “soldiers” in a war, but “inadequates” who should be dealt with by the criminal justice system. Other critics, such as Francis Fukuyama, note that “terrorism” is not an enemy but a tactic; calling it a “war on terror” obscures differences between conflicts. 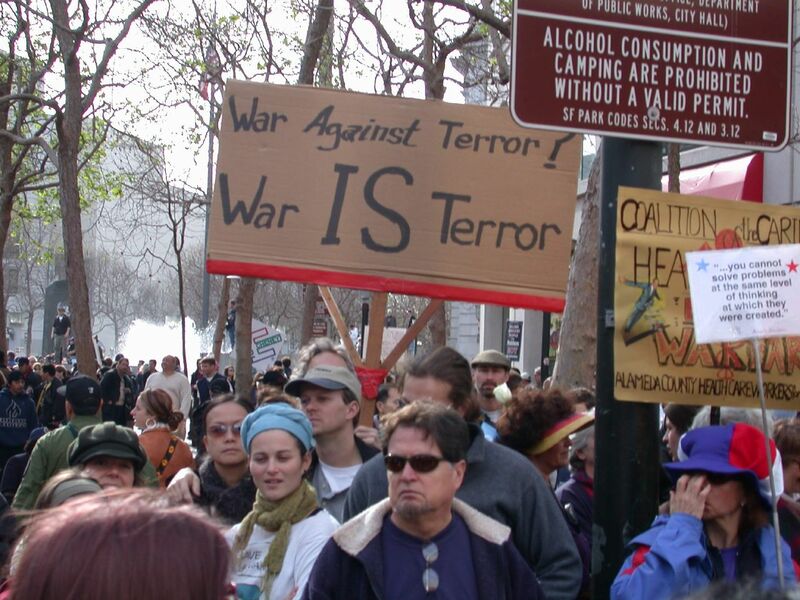 Further criticism maintains that the War on Terror provides a framework for perpetual war; the announcement of such open-ended goals produces a state of endless conflict, since “terrorist groups” can continue to arise indefinitely. George W. Bush pledged that the War on Terror “will not end until every terrorist group of global reach has been found, stopped, and defeated”. During a July 2007 visit to the United States, newly appointed British Prime Minister Gordon Brown defined the War on Terror, specifically the element involving conflict with Al Qaeda, as “a generational battle”. Others have criticized the US for double standards in its dealings with key allies that are also known to support terrorist groups, such as Pakistan. Afghan President Hamid Karzai has repeatedly stated that in the “war against terrorism,” “the central front is Pakistan”; Pakistan has also been alleged to provide Taliban operatives with covert support via the ISI. These accusations of double dealing apply to civil liberties and human rights as well as terrorism. According to the Federation of American Scientists, “[i]n its haste to strengthen the “frontline” states’ ability to confront transnational terrorist threats on their soil, and to gain the cooperation of regimes of geostrategic significance to the next phases of the “War on Terrorism”, the administration is disregarding normative restrictions on US aid to human rights abusers.”Amnesty International has argued that the Patriot Act gives the US government free rein to violate the constitutional rights of citizens. The Bush administration’s use of torture and alleged use of extraordinary rendition and secret prisons have all fueled opposition to the War on Terror. Stella Rimington, former head of the British intelligence service MI5, has criticized the war on terror as a “huge overreaction”, and had decried the militarization and politicization of the US efforts as being the wrong approach to terrorism. In January 2009, the British Foreign Secretary, David Miliband, wrote that “ultimately, the notion is misleading and mistaken” and later said “Historians will judge whether [the notion] has done more harm than good”. Researchers in the area of communication studies and political science have found that American understanding of the war on terror is directly shaped by how the mainstream news media reports events associated with the war on terror. In Bush’s War: Media Bias and Justifications for War in a Terrorist Age political communication researcher Jim A. Kuypers illustrated “how the press failed America in its coverage on the War on Terror.” In each comparison, Kuypers “detected massive bias on the part of the press.” The researcher called the mainstream news media an “anti-democratic institution” in his conclusion. The findings of the research suggest that the public is misinformed about government justification and plans concerning the war on terror. Others have also suggested that press coverage has contributed to a public confused and misinformed on both the nature and level of the threat to the US posed by terrorism. In his book Trapped in the War on Terror political scientist Ian S. Lustick states “the media have given constant attention to possible terrorist-initiated catastrophes and to the failures and weaknesses of the government’s response.” Lustick alleged that the War on Terror is disconnected from the real but remote threat terrorism poses, and that the generalized War on Terror began as part of the justification for invading Iraq, but then took on a life of its own, fueled by media coverage. Media researcher Stephen D. Cooper’s analysis of media criticism Watching the Watchdog: Bloggers As the Fifth Estate contains many examples of controversies concerning mainstream reporting of the War on Terror. Cooper found that bloggers’ criticisms of factual inaccuracies in news stories or bloggers’ discovery of the mainstream press’s failure to adequately check facts before publication caused many news organizations to retract or change news stories. 4410 US military dead. 31,844 wounded in action, of which 13,954 were unable to return to duty within 72 hours. According to Marc W. Herold’s extensive database, between 3,100 and 3,600 civilians were directly killed by US Operation Enduring Freedom bombing and Special Forces attacks between October 7, 2001 and June 3, 2003. This estimate counts only “impact deaths”—deaths that occurred in the immediate aftermath of an explosion or shooting—and does not count deaths that occurred later as a result of injuries sustained, or deaths that occurred as an indirect consequence of the US airstrikes and invasion. In an opinion article published in August 2002 in the magazine The Weekly Standard, Joshua Muravchik of the American Enterprise Institute, questioned Professor Herold’s study entirely on the basis of one single incident that involved 25-93 deaths. He did not provide any estimate his own. In a pair of January 2002 studies, Carl Conetta of the Project on Defense Alternatives estimates that “at least” 4,200-4,500 civilians were killed by mid-January 2002 as a result of the US war and airstrikes, both directly as casualties of the aerial bombing campaign, and indirectly in the resulting humanitarian crisis. His first study, “Operation Enduring Freedom: Why a Higher Rate of Civilian Bombing Casualties?”, released January 18, 2002, estimates that, at the low end, “at least” 1,000-1,300 civilians were directly killed in the aerial bombing campaign in just the 3 months between October 7, 2001 to January 1, 2002. The author found it impossible to provide an upper-end estimate to direct civilian casualties from the Operation Enduring Freedom bombing campaign that he noted as having an increased use of cluster bombs. In this lower-end estimate, only Western press sources were used for hard numbers, while heavy “reduction factors” were applied to Afghan government reports so that their estimates were reduced by as much as 75%. In his companion study, “Strange Victory: A critical appraisal of Operation Enduring Freedom and the Afghanistan war”, released January 30, 2002, Conetta estimates that “at least” 3,200 more Afghans died by mid-January 2002, of “starvation, exposure, associated illnesses, or injury sustained while in flight from war zones”, as a result of the US war and airstrikes. In similar numbers, a Los Angeles Times review of US, British, and Pakistani newspapers and international wire services found that between 1,067 and 1,201 direct civilian deaths were reported by those news organizations during the five months from October 7, 2001 to February 28, 2002. This review excluded all civilian deaths in Afghanistan that did not get reported by US, British, or Pakistani news, excluded 497 deaths that did get reported in US, British, and Pakistani news but that were not specifically identified as civilian or military, and excluded 754 civilian deaths that were reported by the Taliban but not independently confirmed. Two Airmen were killed, another two were wounded at Frankfurt Airport by Arid Uka; they were en route to deployment to Afghanistan. Two radicals, John Allen Muhammad and Lee Boyd Malvo, conducted sniper attacks in Washington, D.C., Maryland, and Virginia in October 2002. Ten people were killed and three others were critically wounded in those shootings. June 1, 2009, Pvt. William Andrew Long was shot and killed by Abdulhakim Muhammad, while standing unarmed outside a recruiting facility in Little Rock AR. On November 5, 2009, Nidal Malik Hasan, an Islamic extremist, shot and killed 13 people and wounded 30 others in Fort Hood, Texas.